TADMAX Resources Bhd said it has not received any notification of termination of the RM3.5 billion power plant project in Pulau Indah that was awarded through direct negotiation by the previous government. 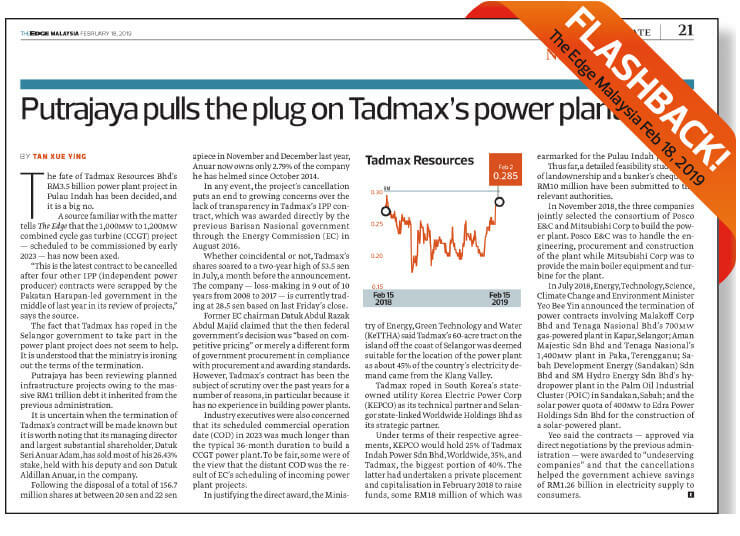 Tadmax’s comment is in response to the article titled Putrajaya pulls the plug on Tadmax’s power plant in The Edge Malaysia (Issue 1254). The company, which is banking on the power plant project for future growth, stressed that it “has complied with all the requirements of all relevant government agencies and has not received any notifications of termination”. Meanwhile, it said it will make the appropriate announcement, upon further material developments on the power plant project. In the filing with Bursa Malaysia, Tadmax said “it is of the opinion that the above article has no basis”. Tadmax, the new kid on the block in the power generation business, has roped in South Korea’s state-owned utility Korea Electric Power Corp (Kepco) as its technical partner and Selangor state-linked Worldwide Holdings Bhd as its strategic partner to carry out the project. Under the terms of their respective agreements, Kepco would hold 25% of Tadmax Indah Power Sdn Bhd, Worldwide, 35%, and Tadmax, the biggest portion of 40%. The Edge Malaysia, citing a source familiar with the matter, said the project, which was scheduled to be commissioned by early 2023, has been axed. It is understood that the ministry is ironing out the terms of the termination, according to the weekly. To recap, Energy, Technology, Science, Climate Change and Environment Minister Yeo Bee Yin announced the ministry’s intention to review the independent power producer projects that had been awarded previously as part of the reform of the domestic power industry. Already, the ministry had announced the termination of power contracts that had been granted to Malakoff Corp Bhd and Tenaga Nasional Bhd’s 700mw gas-powered plant in Kapar, Selangor; Aman Majestic Sdn Bhd and Tenaga Nasional’s 1,400mw plant in Paka, Terengganu; Sabah Development Energy (Sandakan) Sdn Bhd and SM Hydro Energy Sdn Bhd’s hydropower plant in the Palm Oil Industrial Cluster in Sandakan, Sabah; and the solar power quota of 400mw to Edra Power Holdings Sdn Bhd for the construction of a solar-powered plant. Yeo then said the contracts — approved via direct negotiations by the previous administration — were awarded to “undeserving companies” and that the cancellations helped the government achieve savings of RM1.26 billion in electricity supply to consumers.